Designing a small dining room can be quite difficult when most of the dining room table options and sets on the market are just too big for your current space. From large tables and chairs to buffets and china cabinets that you may like, but not have enough space for, you could be facing a real design dilemma. No matter how small your dining room may be, these top ideas will help you to find dining tables that are sure to fit your space and work effectively in the area without making it look too overcrowded. By sticking to the basics and essentials, you’ll be well on your way to designing the perfect small dining room space. Designing your dining room with dining tables that resemble a craft table or booth can help you to save a lot of space in your dining space. Rather than placing a large table right in the center of the room, booth style seating is an excellent option to put in corners. Opt for wooden materials that give the home a more contemporary look and feel. In addition, the table can be used for projects and more when it is not being used for dining. Small dining rooms can really benefit from tables and chairs in the white color family. White opens up and brightens the space, making it appear larger than it really is. 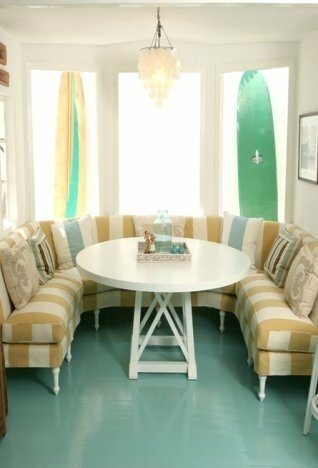 You may also opt to pair your white chairs with a small glass-top table that will complete the whole look. It’s always nice to be able to have extra seating available when you have guests come over for dinner, but storing dining room chairs and table leaves can take up a lot of space within your home. Instead, opt for a narrow bench that can be placed against the far wall. Throw some cushions over the bench for a stylish look when it is not being used. This is an excellent way to save space for your dining room table, no matter what size room you are working with. Opt to add a round pedestal table to your small dining room to eliminate clutter which creating a calm and comfortable eating spot. Choose a table that allows seating for 4 with room to add additional chairs if needed. Pedestal tables make it easy to add additional chairs because there are not legs that you may bump into that are typically found on square and rectangle tables. Opt for a glass tabletop to make it look as though the table isn’t really even there, opening up the room and creating the appearance of more space. If you are working with a limited amount of space in your dining room, you may choose a long and lean table with armless side chairs. Chairs without arms make it much easier to seat additional guests comfortably without bumping into each other. By taking advantage of these helpful tips, you are sure to have a stylish, comfortable and spacious dining room with very little effort. Shop around for the perfect dining room table to find exactly what you’re looking for in your space.